I was diagnosed with retinitis pigmentosa (RP) at the age of 19. I was told that I’d lose my sight. 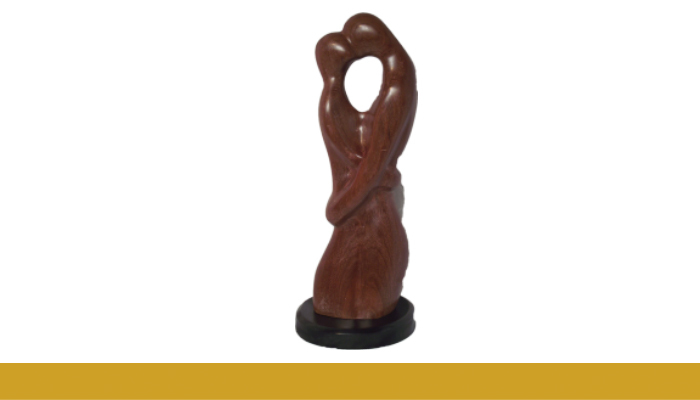 I was registered blind in 2004, aged 29, but this hasn’t stopped me from achieving success in my chosen field – sculpture. My pieces, crafted from wood, have become symbolic of the progression of my condition. My style, based on form, curves and shapes, has become more clearly defined as my vision has faded. I held a solo exhibition at the House of Commons in 2015. The event was well received by the national press, including the BBC. My recent ‘Blind: A Sixth Sense’ exhibition consisted of six pieces that represented the five senses and freedom. It was designed to be experienced in the pitch black and is currently under consideration by the Turner Contemporary for their 2020/21 programme. In addition to my artwork, I am also an Ambassador for RP Fighting Blindness.